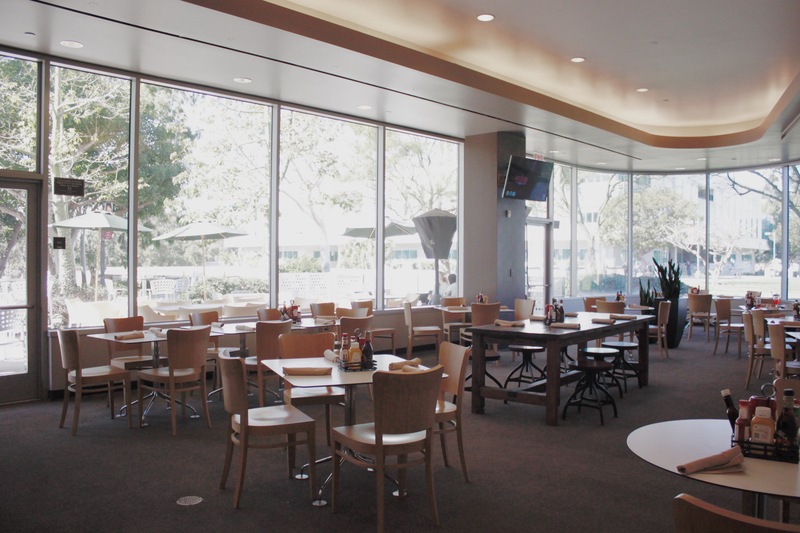 Campus dining isn’t limited to what is located in the open areas of the Loker Student Union. Tucked in the northwest part of the building is the easily missed 1910 Café and Lounge. It’s a peaceful place to have a sit-down meal with friends or even have a moment to yourself to study. Unlike our other eateries, it is more of a restaurant and even offers a dining area that, compared to the food court, is almost elegant. While an essential part of the food offered in the LSU, the name of the café is different from the mostly chain restaurants. Olympia Woods, marketing coordinator for campus dining services, said that 1910 Café and Lounge received its name from the Great Air Meet in Carson which took place in January 1910. Because it feels somewhat removed from the hustle and bustle of the LSU, some students may believe 1910 Café is reserved only for faculty, administrators and important meetings. “I’ve only ever seen professors in there, so it looks exclusive and I thought I needed a reservation to dine in there,” said Sydney Edwards, a liberal studies major. In reality, 1910 Café is for anyone to enjoy. It’s recently changed its seating policy to more easily accommodate different groups. Now, when walking into the restaurant, instead of being seated by a hostess or server, as it used to be, you order your food at the counter first. The menu is on a big sign that hangs on the wall to the right of the cash register. If you’re looking for a simple burger or sandwich with fries, they have it. There are even burgers with an extra kick such as the Kobe wagyu burger for $12.95 that has an Angus wagyu beef patty served with different types of interesting condiments and a side of beer-battered fries. You can also order from the “small bites” section of the menu, which includes offerings ranging from crispy garlic brussels sprouts ($4.95) to avocado toast and hummus with a side of pita bread ($4.95). Other sections of the menu include soups and salads (ranging between $4.95- $6.95 depending on what you order), different types of pizzas ($6.99-$8.99), including an option to make your own: fish tacos ($7.98), burritos ($5.00), quesadillas ($5.50), chicken strips ($7.95), steak ($14.95) and plenty more. While carnivores can indulge in the $14.95 ribeye steak, the cafe is also vegetarian-friendly. Those options, such as the Impossible Burger, ($12.95) can be found throughout the menu with a help of a color code at the top of the menu. After paying for your meal, you get to choose where you want to sit. There are tables inside where glass windows surround the restaurant providing a view of the University Theatre, Welch Hall and the North Lawn. If you want to dine al fresco, there is also an area for that with a better view those places plus the West Walkway. For those in a rush, take-out is also offered. “It’s a great place for me and my girlfriend to have lunch because it feels like we’re at a fancy restaurant and we didn’t even have to leave campus,” Sergio Sandoval, music major said. 1910 Café and Lounge hours are Monday through Thursday 10:30 a.m. to 4:30 p.m. The number is (310) 243-2297. By phone, you can make reservations or catering events at (310) 243-3814.